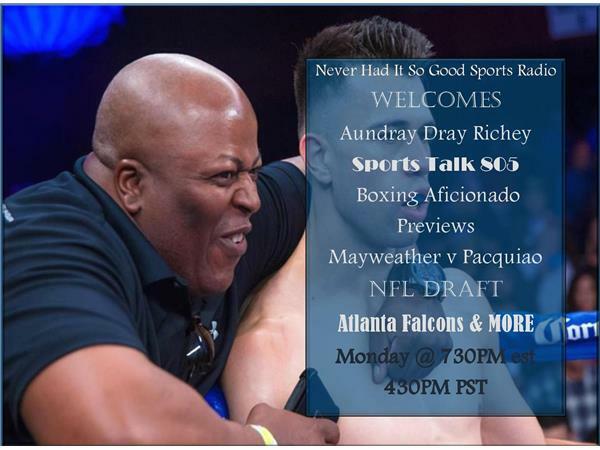 Mayweather v Pacquiao Discussion & NFL Draft Preview with Aundray Richey & Crew! Mega Fight is less than a week away. Excited to see what goes down with that. And, then the NFL Draft starts on Thursday. What happens with Winstons? Mariota Trade. And, will Tebow stick? Will Bradford be a Brown. We think we know who is going #1 in the NFL Draft but what about the next 9 picks. And, of course there will be some trades No one is talking right now but, I expect some blockbuster trades in the next couple of days.